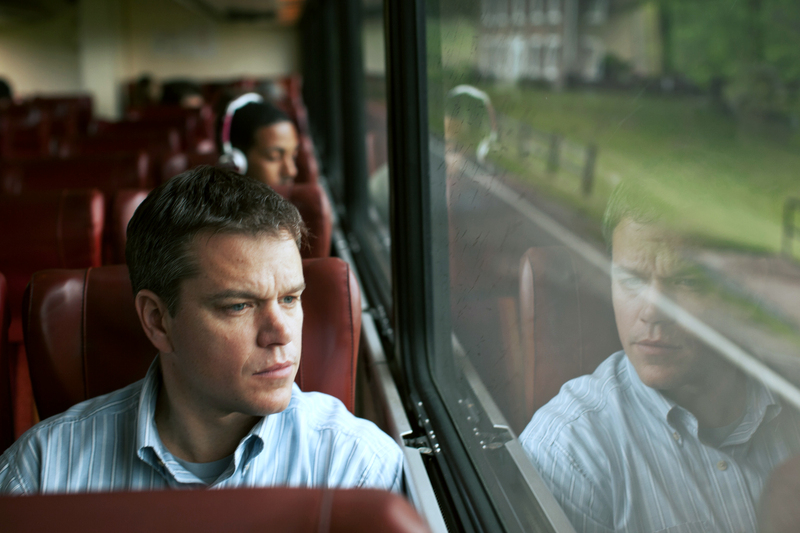 Director Gus Van Sant reunites with Good Will Hunting star Matt Damon for Promised Land (2012), which finally makes its way into UK cinemas this week. Whilst enjoyable and thought-provoking in parts, a third act revelation is more frustrating than shocking, leaving us to rue what might have been. Damon plays Steve Butler, a farm boy-turned-smooth-talking corporate salesman who’s rapidly rising up the ranks of his gas company. His latest, biggest assignment sees him and sales partner Sue Thomason (an entertaining Frances McDormand) dispatched to the rural town of McKinley to acquire the drilling rights to their properties. What initially looks to be an easy task and a short stay for the pair gets more complicated with the interventions of admired schoolteacher Frank Yates (Hal Holbrook) and slick environmental activist Dustin Noble (John Krasinski). Adapted from a story by American writer Dave Eggers, Damon and Krasinski’s screenplay concerns itself with a lot of relevant issues including the fallibility of ‘fracking’ – the process whereby shale deposits can be obtained by drilling through the Earth’s crust – and on how much value we place on riches and wealth. The best debates ensue when neither party is entirely right or wrong, and for the first hour or so there is an engaging quarrel between the salespeople and the townsfolk. This extends to the competition between Butler and Krasinski’s smug environmentalist Noble, which produces some of Promised Land’s more light-hearted moments. Provocative questions are posed throughout, and a standout scene where Damon’s character bottom lines the benefits of signing the contracts and accepting the money is particularly effective. Would you potentially destroy your home if it meant better security for your family and college tuition for your kids? Sadly, much of this is negated by an unexpected third act twist which substitutes this compelling moral dilemma for another. The final message we’re left with is one that is still worthwhile, and in doing so it completes character arcs neatly, but it would have been more interesting to see how events would have played out had they gone unimpeded. Once again, Damon proves that he is just as proficient in portraying an everyman as he is an action one. Clad in his grandfather’s working boots, Butler truly believes in what he’s offering at the film’s outset, and Damon’s performance is filled with sincerity. Also great to watch is the witty repartee between Butler and sales partner Sue, with McDormand in particular displaying some great comedic timing. Elsewhere however, Rosemarie DeWitt’s Alice is short-shifted; a scene outlining why she remained at her family’s farm is not enough to disguise the fact that her character is poorly written, with little to no reason given as to why she flits between the two leading men. In the end, Promised Land is a good film that was on the cusp of being great. Regrettably, the unwillingness to dig deeper into its important issues ends up lessening the film’s impact. This entry was posted on April 19, 2013 by Amonymous. It was filed under Film Reviews and was tagged with Dave Eggers, Frances McDormand, Gus Van Sant, Hal Holbrook, John Krasinski, Matt Damon, Promised Land. Good review man. The movie is preachy, but also sort of obvious and weakly-written. I agree with what it has to say, but could have been done a lot better.